During breakfast last fall at a Double T Diner near Catonsville, Md., Don Zimmerman pondered his future in lacrosse. 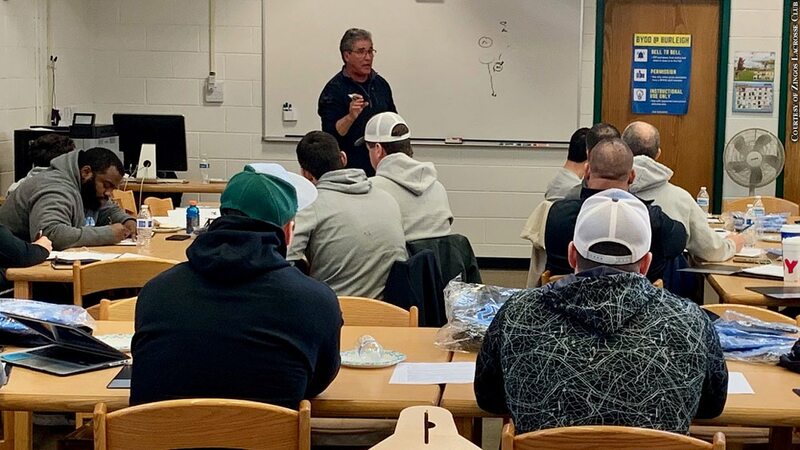 Sitting at the table with the former UMBC men's lacrosse coach were Ken and Mike Senisi, who were seeking a little guidance, expertise and name recognition for their Zingos Lacrosse Club. "I really liked what they had to say," said Zimmerman, 66, who retired in 2016 after 23 years at UMBC and was recently inducted into the school's Athletics Hall of Fame. "I really liked their approach to things and perspective. The fact that this just wasn't getting [the kids] in shape and going out and playing games appealed to me. It was about teaching fundamentals and doing things the right way." So, Zimmerman came on board with Zingos as a consultant and has been a regular presence at practices, clinics and coaching seminars throughout the past six months. During the winter, Zimmerman ran an eight-week clinic at Atholton High School (Columbia, Md.) for Zingos members that focused on fundamental lacrosse and player development. "When it's 20 degrees outside and there are 50 kids out there working on getting better, that means more to me than tournament championships," Ken Senisi said. "It really does." Zimmerman has also been a valuable resource for Zingos coaches and parents in terms of sharing insights and familiarizing them with the college recruitment process. "It's hard to describe [his value]. He is a role-model type of guy to me," Ken said. "From his knowledge of the game to how he works with players from all different age groups, his feedback on certain things, you can't measure it. He's been a great asset to Zingos, and, hopefully, he is getting something out of it, too." The Zingos Lacrosse Club is in its 10th year and seeks to provide elementary, middle and high school-aged boys from Maryland, Washington, D.C., and Northern Virginia with "the maximum lacrosse experience." Players watch film with coaches and get the chance to compete in games. The focus is on improving and preparing to take the next step in the sport, whatever that may be. The term Zingo itself was coined by Major League Lacrosse commentator (and former Johns Hopkins star) Quint Kessenich to describe a lengthy, high-velocity shot. The club, founded by former Mount Hebron and McDonogh girls' lacrosse coach Chris Robinson, originated with five teams and has grown to 11 since Ken and Mike Senisi took over four years ago. Ken is a seventh-grade science teacher at Burleigh Manor Middle School (Ellicott City, Md. ), and Mike serves as the athletic director at Atholton. "It's just something I really love doing," Ken said. "If I didn't love lacrosse and working with kids, it would be hard to find the energy to do this." The Senisi brothers' passion for the game is what resonated with Zimmerman during their breakfast meeting at Double T Diner. When he is not teaching lacrosse, Zimmerman, who led UMBC to six NCAA Tournament appearances, works as a color analyst on ESPN for high school and college games. He also enjoys the spoils of retired life on the golf course and with his wife, Dorothy, and two grandsons. But he always makes time for lacrosse, a game he has loved since he was a young boy growing up in Mount Washington. "I just help [Zingos] out any way that I can," Zimmerman said. "My enjoyment is teaching the game to kids and coaches."